EVERY DAY AN ADVENTURE, EVERY DAY 100%, EVERY DAY ICEPAW. We believe that strong bonds are the key to a high and healthy performance. 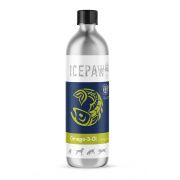 ICEPAW products are the result of years of research in the most competitive environments, embracing mother nature as unrivalled role model. 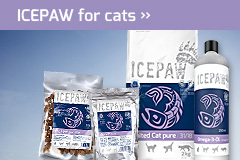 ICEPAW food makes our animal partners stronger because it respects their nature and is produced in accordance with the highest standards. 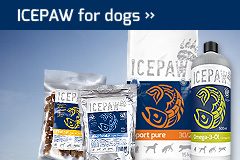 With ICEPAW, we have developed a trailblazing nutritional concept for dog nutrition. These products are the culmination of our many years of active, everyday observation and nutritional analyses in active dog performance sports on a global level, as well as our activities breeding dogs for competitive sports. With these findings, we are one of the first manufacturers to produce finely attuned, easily tolerated food-grade dog food products made primarily of fresh fish with a high proportion of fish meat and high-quality Omega 3 / 6 fish oils, or with lamb and high meat content. 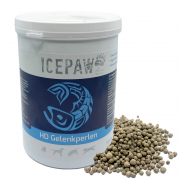 You can be certain that, with ICEPAW, you are feeding your dog food that has been optimally adapted to the nutrient and energy needs of your pet, that will keep your pet strong and healthy, and that can prevent or reduce feed sensitivities or intolerances.